Since the introduction of Direct3D 12 and other low-level graphics APIs, the bulk of our focus has been on the high end. One of the most immediate benefits to these new APIs is their ability to better scale out with multiple threads and alleviate CPU bottlenecking, which has been a growing problem over the years due to GPU performance gains outpacing CPU performance gains. However at the opposite end of the spectrum and away from the performance benefits are the efficiency benefits, and those are gains that haven’t been covered nearly as well. With that subject in mind, Intel is doing just that this week at SIGGRAPH 2014, where the company is showcasing both the performance and efficiency gains from Direct3D 12 on their hardware. When it comes to power efficiency Intel stands to be among the biggest beneficiaries of Direct3D 12 due to the fact that they exclusvely ship their GPUs as part of an integrated CPU/GPU product. Because the GPU and CPU portions of their chips share a thermal and power budget, by reducing the software/CPU overhead of Direct3D, Intel can offer both improved performance and power usage with the exact same silicon in the same thermal environment. With Intel's recent focus on power consumption, mobile form factors, and chips like Core M, Direct3D 12 is an obvious boon to Intel. Intel wisely demonstrated this improvement using a modern low-power mobile device: the Microsoft Surface Pro 3. For this demo Intel is using the Core i5-4300U version, Microsoft’s middle of the road model that clocks up to 2.9GHz on the CPU and features one of Intel’s HD 4400 GPUs, with a maximum GPU clockspeed of 1.1GHz. In our testing, we found the Surface Pro 3 to be thermally constrained – throttling when met with a medium to long duration GPU task. Broadwell should go a long way to improve the situation, and so should Direct3D 12 for current and future Intel devices. 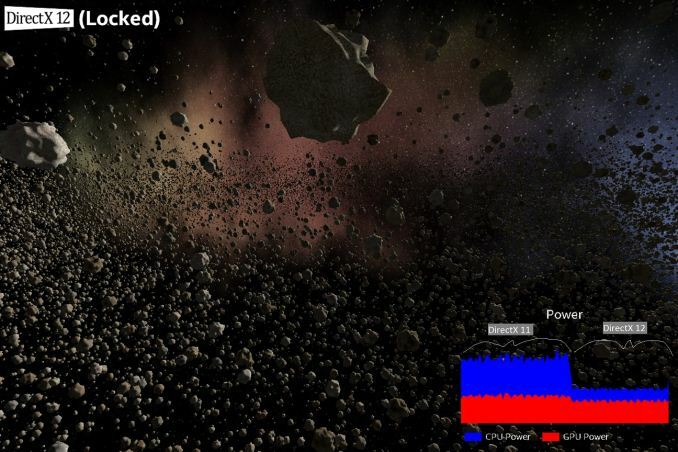 To demonstrate the benefits of Direct3D 12, Intel put together a tech demo that renders 50,000 unique asteroid objects floating in space. The demo can operate in maximum performance mode with the frame rate unrestricted, as well as a fixed frame rate mode to limit CPU and GPU utilization in order to reduce power consumption. 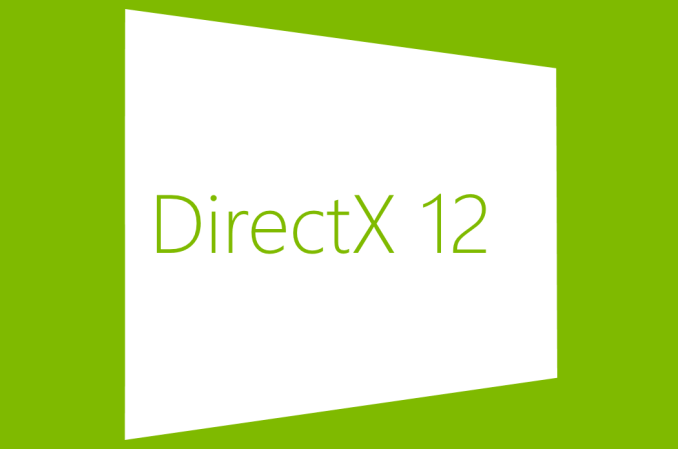 The demo can also dynamically switch between making Direct3D 11 and Direct3D 12 API calls. 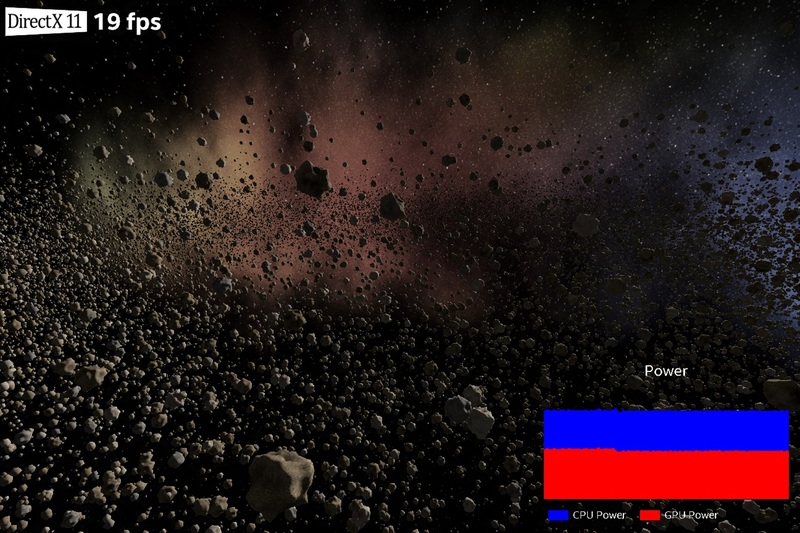 Additionally, an overlay shows power consumption of both the CPU and GPU portions of the Intel processor. Intel states this demo data was taken after steady-state thermals were reached. In the performance mode, Direct3D 11 reaches 19 frames per second and the power consumption is roughly evenly split between CPU and GPU. Confirming that while this is a graphical demo, there is significant CPU activity and overhead from handling so many draw calls. 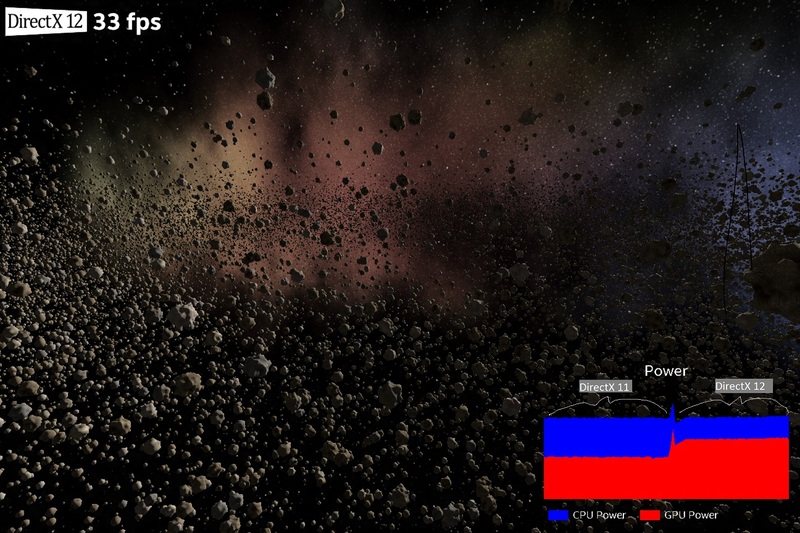 After dynamically switching to Direct3D 12 while in performance mode, the frames per second jumps nearly 75% to 33fps and the power consumption split goes from 50/50 (CPU/GPU) to 25/75. The lower CPU overhead of making Direct3D 12 API calls versus Direct3D 11 API calls allows Intel's processor to maintain its thermal profile but shift more of its power budget to the GPU, improving performance. Finally, in the power efficiency focused fixed frame rate mode, switching between Direct3D 11 and 12 slightly reduces GPU power consumption but dramatically reduces CPU power consumption, all while maintaining the same 19fps frame rate. Intel's data shows a 50% total power reduction, virtually all of which comes from CPU power savings. As Intel notes, not only do they save power from having to do less work overall, but they also save power because they are able to better distribute the workload over more CPU cores, allowing each core in turn to run at a lower clockspeed and voltage for greater power efficiency. To put these numbers in perspective, a 50% reduction in power consumption is about what we would see from a new silicon process (i.e. moving from 22nm to 14nm), so to achieve such a reduction in consumption with software alone is a very significant result and a feather in Microsoft’s cap for Direct3D 12. If this carries over to when DirectX 12 games and applications launch in Q4 2015, it could help usher in a new era of mobile gaming and high end graphics. It is not often we see such a substantial power and performance improvement from a software update. I expect that AMD is the biggest beneficiaries to D12 and not Intel. AMD always had more but slower CPUs (poor single threading, good multi-threading), with a much more powerful GPU, compared to Intel. Of course the benefits are greatest with APUs. If you have fast CPU and fast discrete GPU the difference is much, much smaller. But still a good thing! Even 3-5% is better than nothing!